In this article we are going to introduce you the largest moons of Jupiter. Jupiter is considered to be the planet of having the largest number of moons in our Solar System. 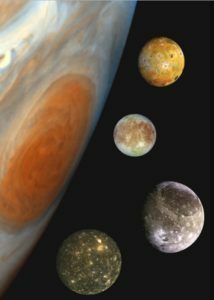 There are 69 known moons of Jupiter, but the most massive or better to say the largest moons of Jupiter are the Galilean four moons. These objects were discovered in 1610 by Galileo Galilei and Simon Marius which were the first objects found to orbit a body that was neither Earth nor the Sun. 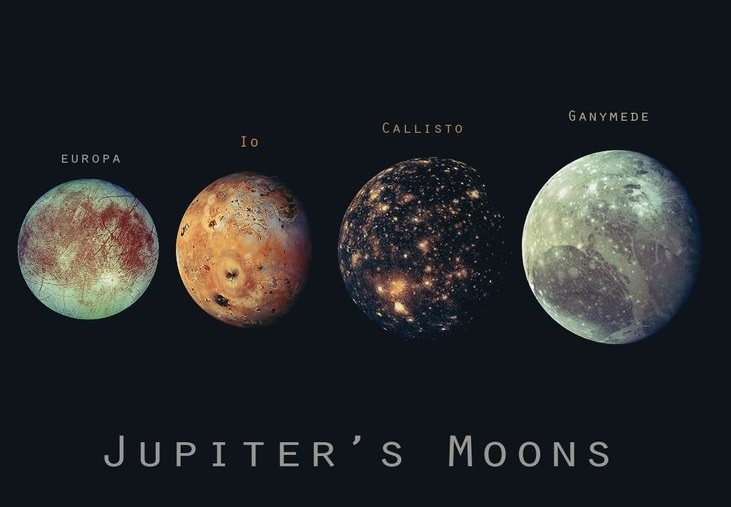 The Galilean moons are the four largest moons of Jupiter; they are Io, Europa, Ganymede, and Callisto. As we have mentioned above they were first seen by Galileo Galilei in January 1610 and they are the first objects found to orbit another planet. They are the largest objects in the Solar System with the exception of the Sun and the eight planets, with a radius larger than any of the dwarf planets. 1. Ganymede is the largest and most massive moon of Jupiter in the Solar System. Also it is the largest moon without a substantial atmosphere. Ganymede has a diameter of 5,268 km and is 8% larger than the planet Mercury. It is the only moon known to have a magnetic field. 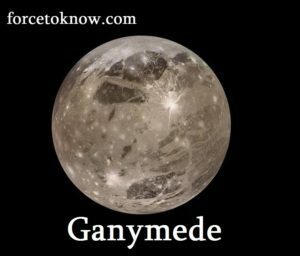 Ganymede is composed of approximately equal amounts of silicate rock and water ice. It is a fully differentiated body with an iron-rich, liquid core, and an internal ocean that may contain more water than all of Earth’s oceans combined. The satellite’s name was soon suggested by astronomer Simon Marius, after the mythological Ganymede, cupbearer of the Greek gods and Zeus’s lover. 2. 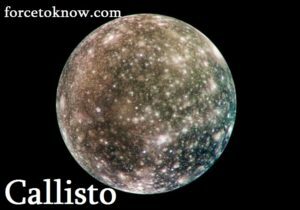 Callisto is the second largest moon of Jupiter, after Ganymede but it is the third largest moon in the Solar System after Ganymede and Saturn’s largest moon Titan. At 4821 km in diameter, Callisto has about 99% the diameter of the planet Mercury but only about a third of its mass. It is the fourth Galilean moon of Jupiter by distance, with an orbital radius of about 1883000 km. Callisto is composed of about equal amounts of rock and ices and is the lowest density and surface gravity of Jupiter’s major moons. Investigation by the Galileo spacecraft revealed that Callisto may have a small silicate core and possibly a subsurface ocean of liquid water at depths greater than 100 km. Its surface is completely covered with impact craters. It is surrounded by an extremely thin atmosphere composed of carbon dioxide and probably molecular oxygen, as well as by a rather intense ionosphere. 3. 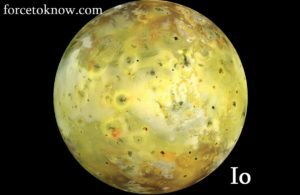 Io is considered as one of the largest moons of Jupiter. It has the highest density of all the moons, and has the least amount of water of any known astronomical object in the Solar System. It was discovered in 1610 and was named after the mythological character Io, a priestess of Hera who became one of Zeus’ lovers. With over 400 active volcanoes, Io is the most geologically active object in the Solar System. Io is rocky, volcanically active moon of Jupiter which has a diameter of 3,636 km. 4. Europa is the smallest of the four Galilean moons orbiting Jupiter, and the sixth-closest to the planet. Europa was named after the legendary mother of King Minos of Crete and lover of Zeus. Slightly smaller than Earth’s Moon, Europa has a diameter of 3,100 km. 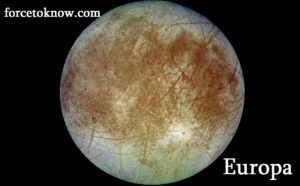 Europa is primarily made of silicate rock and has a water-ice crust and probably an iron–nickel core. It has a tenuous atmosphere composed primarily of oxygen. Its surface is striated by cracks and streaks, whereas craters are relatively rare. Europa has the smoothest surface of any known solid object in the Solar System. To sum up our article we would like to touch upon the fact that Galileo’s discovery showed the importance of the telescope as a tool for astronomers by proving that there were objects in space that cannot be seen by the naked eye.